By the end of 2018, the distillery had filled 18,003 barrels of whiskey – surpassing its goal for the year! Thanks to fantastic work by the production crew at the distillery and smooth operations, the team was able to increase its original 2018 barrel goal and meet it. Construction on a third barrel warehouse is set to be completed this spring to make room for our growing barrel count. Each rickhouse has the capacity to hold 20,000 barrels for aging. The Lux Row Brand Ambassadors have been quite busy, as over 10,000 people have visited the distillery since the Grand Opening last April. During the winter, tours were busier than expected, and the tour ambassadors have seen many repeat visitors. In addition, the distillery has added extended tour options. Now, visitors are able to book a VIP tour, where they will receive an even more in-depth tour of the distillery and its operations, a more robust tasting experience, and a souvenir Lux Row glass. These VIP tours run three times per week. Also, once a month, Head Distiller John Rempe welcomes visitors for a Blood Oath® VIP event where visitors receive a two-hour tour with John, as well as a tasting of the full Blood Oath lineup of bourbons. The feedback has been incredible and visitors have been blown away by the tours! 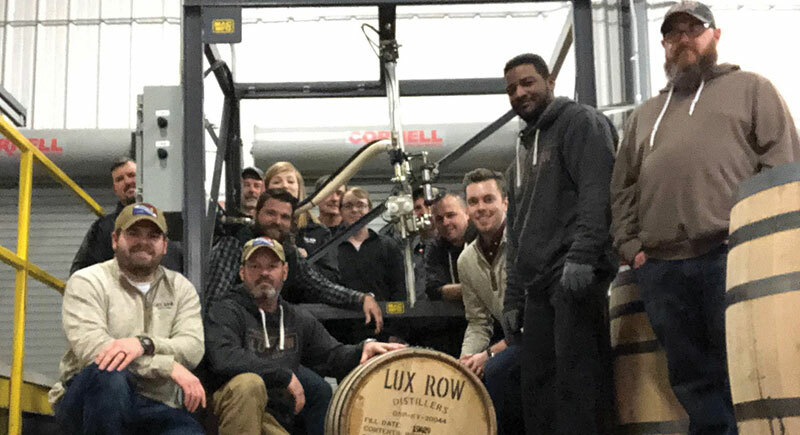 Also at the end of 2018, the National Alcohol Beverage Control Association (NABCA) Industry Relations Committee traveled to Kentucky for a visit to Lux Row Distillers. Donn Lux and John Rempe led the tour, where nine of the committee members learned more about the family history, the distillery operations and the bourbon product lineup. With all of these updates and more, 2019 is shaping up to be a successful year at Lux Row – we’re looking forward to an exciting year!